With this practice I hope to cultivate not only a deeper practice for you, but also a sense of community with you. I want to nurture a supportive environment where we assist each other with the gross physical asana (things like correct positioning and where stretches can be felt) as well as the smaller subtleties (things like breath and movement of energy) of the asana. In the beginning of class I will act as a leader or guide as opposed to a teacher (allowing you to make adjustments and find your asana), but as the class progresses and we move into more advanced postures I will become more of a teacher. Advanced yoga is not about putting your leg behind your head. It is about stopping where you should stop, and pushing where you should push. 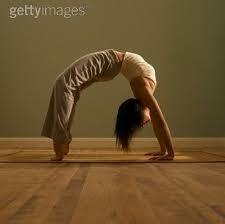 We will work with advanced postures, and I won't spend time teaching headstands, instead I will say 'Take a headstand.' You must be comfortable taking a headstand in the middle of the room, or sitting it out. I would like you to be able to kick into a handstand, lift into a full backbend (urdhva dhanurasana, pictured), and be comfortable assisting other people in the class with various postures. See you on Monday nights, 6:30-8:00!